Imagine getting a call from your aging mother who tells you she doesn’t feel well. At first it was just a bit of belly pain, then she developed a fever and nausea. You know something’s wrong so you take her to the local emergency department hoping it is something simple. The wait isn’t too long and the caregivers treat your mom compassionately with some pain medicine, antibiotics, nausea medication and IV fluids. They tell you she has diverticulitis, an infection around the colon, and that she will need to be admitted to the hospital. Unfortunately the hospital is pretty full and she has to wait in the emergency department for 15 long hours before she can go up to a bed. But at least she is safe in the emergency department; or is she? Boarding — waiting in the emergency department to go to an inpatient bed — is one of the most significant patient safety issues in the United States, in Massachusetts and yes, right here at UMass Memorial. 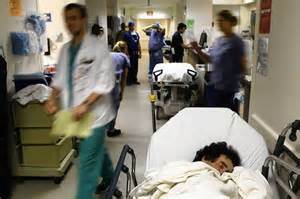 Studies, such as this one in the journal Academic Emergency Medicine (http://onlinelibrary.wiley.com/doi/10.1111/j.1553-2712.2011.01236.x/full), show that for every 12 hours a patient boards in the emergency room, mortality increases by two percent. Statistically, given the magnitude of this problem across the United States, that means dozens of people are dying every day unnecessarily because we haven’t fixed a patient flow problem. That’s why “boarder hours” is going to become our most important quality metric this year and we are going to dedicate significant time, energy and resources into fixing this problem over the next few months. More to come on this in future posts. Last week I visited the Medical Center’s 3 Lakeside and met a patient who had undergone endovascular repair of an aortic aneurysm. This is a procedure done through a vascular catheter to fix ballooning of the aorta, the largest blood vessel in the body. It was a very complicated aneurysm that involved the arteries to the kidneys and intestines. Just a few years ago this condition was considered a lethal diagnosis, but now, thanks to innovations piloted by our own Dr. Andres Schanzer, the patient was sitting up in 24 hours asking to go home. 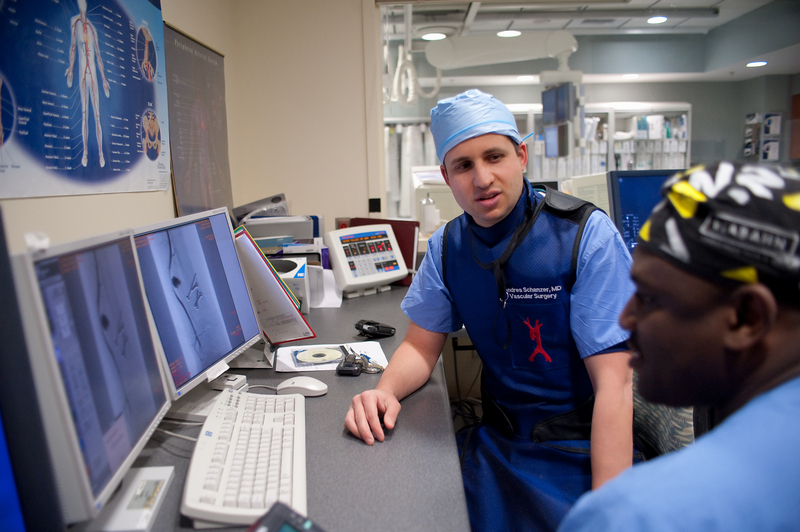 Our vascular division is one of only two FDA-approved programs in the entire country that currently performs this ground-breaking procedure. Dr. Schanzer explained that, in the past, patients were told there were no available treatment options for their disease because of the high risks associated with open repair. Now we can treat these patients with a minimally invasive technique, and many of them are able to return home independently within 1 to 5 days after surgery. Simply amazing! I also visited the NICU on Medical Center’s Memorial Campus and some of our tiniest patients who were getting great care, the Memorial SICU and the folks in Central Scheduling who are working their tails off getting our patients their appointments. Many thanks to all for your hospitality and I promise I will work on implementing some of your recommendations on how to make UMass Memorial a better place to give and get care. I was delighted to read the latest report on alternative quality contract (AQC) performance from our Office of Clinical Integration. We established our AQC with Blue Cross Blue Shield of Massachusetts in February of this year to encourage cost-effective, high quality patient-centered care. How are we doing so far? Our current performance score signals a significant improvement over last year and our primary care practices are still working hard to become the very best. We salute the practices that have earned the distinction of most improved and best-performing practices, some several times, over the first three quarters of this year. Our most successful primary care practices are leading the way, using teamwork, new ideas and innovation to improve clinical care, service excellence and efficiency, all of which are core to AQC performance improvement. 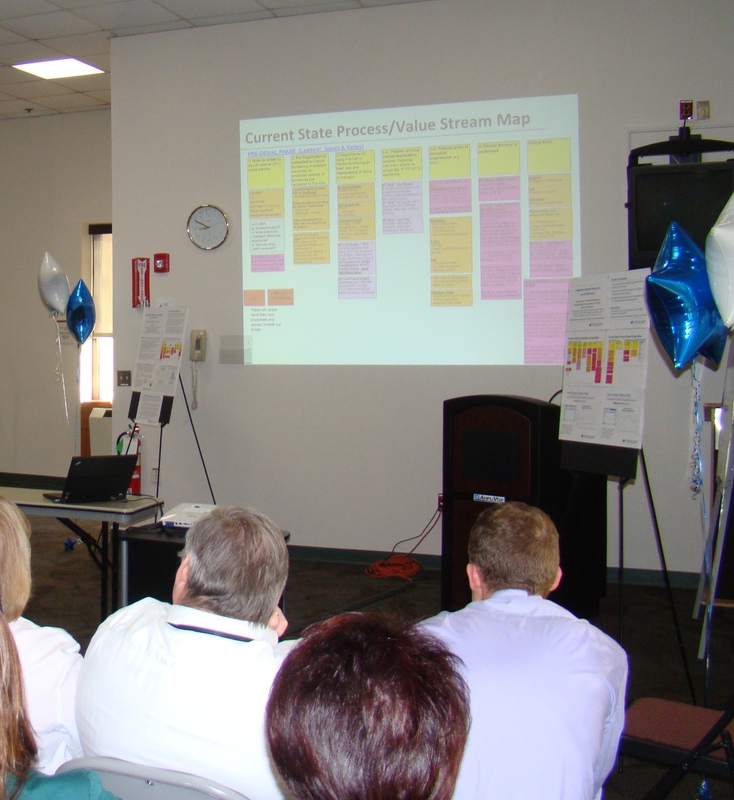 Attendees came from throughout the system to celebrate the successful implementation of Lean principles at Marlborough Hospital. These celebrations take place across our system. Don’t miss the Medical Center’s event on December 10 at 3 pm. As always, thank you taking great care of our patients, and each other. This entry was posted in Employees and tagged employees by Eric Dickson, MD, MHCM. Bookmark the permalink.